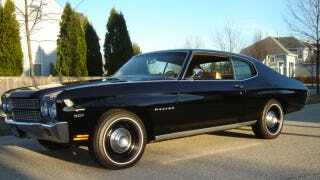 It is easy to mistake this 1970 Chevrolet Chevelle Malibu for a nicely restored stock car. Unless you happen to notice the unique "white wall tires" mounted on the stock 15x7 wheels, there is nothing to suggest this car is any different from the average cruise night Chevelle. That is of course until you get a look under the hood and realize this unassuming Chevelle is actually a well disguised twin turbo beast. We aren't exactly sure what the perfect sleeper is, but it isn't a stretch to imagine the beautiful black Chevelle seen here is pretty close. Like any good sleeper there is almost nothing to indicate this car's true performance potential. Everything from the 307 emblems on the fenders to the stock interior complete with bench seat and console shift point to the fact this is nothing more than a nice old Chevy in from the factory condition. Not available from the factory in 1970 is the monster Escalade sourced twin turbo 6.0L LQ9 iron block V8 that powers this sleeper. Equipped with a pair of turbos from a Buick Grand National the car produces 555-607 horsepower (depending on boost) without any signs of turbo lag. This translates into a car that can run a low 11 second to high 10 second 1/4 mile at the track and get 20 MPG with the A/C blasting on the way home. The result is the sleepiest of sleepers with a ton of usable power. You can get an idea of what this awesome Chevelle looks like in action here. We can't tell you how badly we would love to own this impressive Chevelle, unfortunately we are a little bit shy of the $40,000 asking price. To us, nothing says "perfect daily driver" like a 600 horsepower Chevelle that looks like it's fresh out of Grandma's garage.